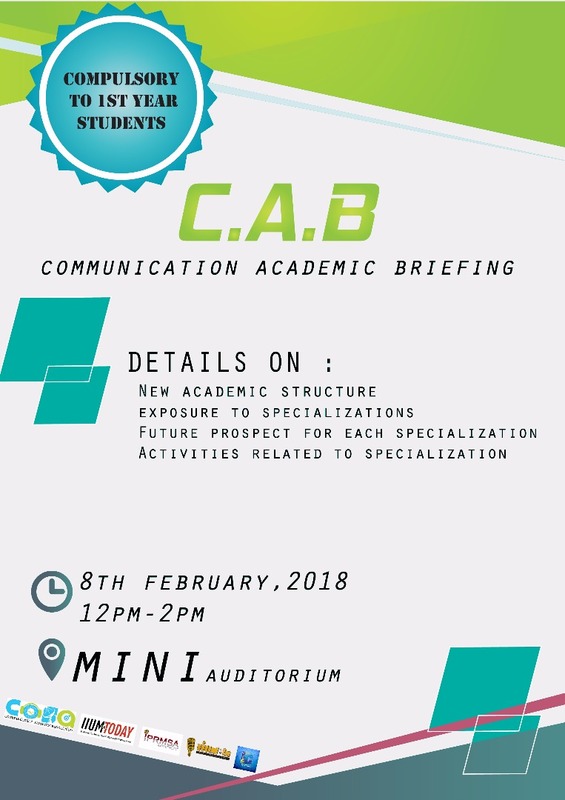 GOMBAK, 7 February 2018 – Communication Department will be holding its Communication Academic Briefing (CAB) on Thursday (8 February) from 12.00 noon to 2.00 p.m at Mini Auditorium to brief first year students on the availability of courses offered and to assist them in their study plan for the undergraduate programme at the university. CAB is organised every semester to provide students with useful information on courses offered by the Department, the communication societies and related entities, and activities conducted where students could learn to interact and be exposed to certain knowledge and skills. This semester’s CAB is significant as it is going to shed light on the new academic structure, exposure to specialisations, future prospects for each specialisation, and activities related to specialisation, according to sources from Communication Department. Students will have the opportunity to be exposed to various platforms available for Communication students such as IIUMToday, IIUM.fm, Communication Students Association (COSA), Institute of Public Relations Malaysia Students Association (IPRMSA) – IIUM Chapter, and COMMTV which provide them with hands-on learning experience.